This post is sponsored in conjunction with ChristmasCookiesWeek . I received product samples from sponsor companies to aid in the creation of the ChristmasCookiesWeek recipes. All opinions are mine alone. 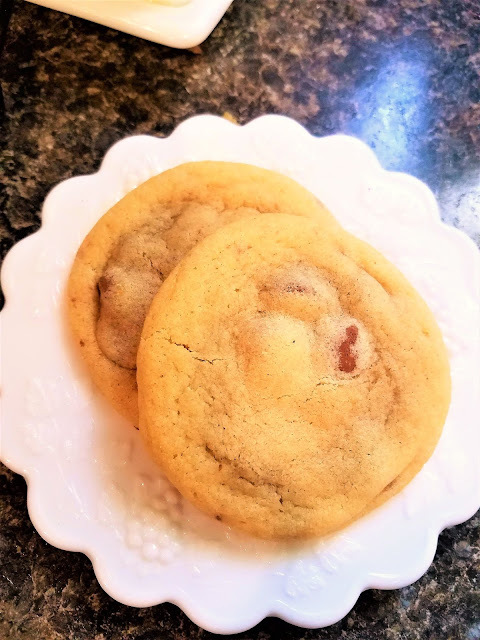 These are the softest Chocolate Chip cookies you'll ever eat! They have that classic, traditional taste you expect, but are superbly moist and light, not heavy or overly chewy! Just a dream to eat! In fact, they'll be gone so fast, you'll think you dreamed them up! They have the perfect balance of delicate softness with the right amount of "chewy" you want in a cookie! Not too much, not too little. The sweetness and buttery flavor is perfectly balanced, making this recipe a classic, keeper! My daughter is the culprit .. er source of this recipe for me! She makes these ALL the time! She found them over at Sweet Cake Mama and I'm glad she did! They really are wonderful! Sometimes with chocolate chips, sometimes with chocolate candy pieces! during the summer we even used them to make ice cream sandwiches. 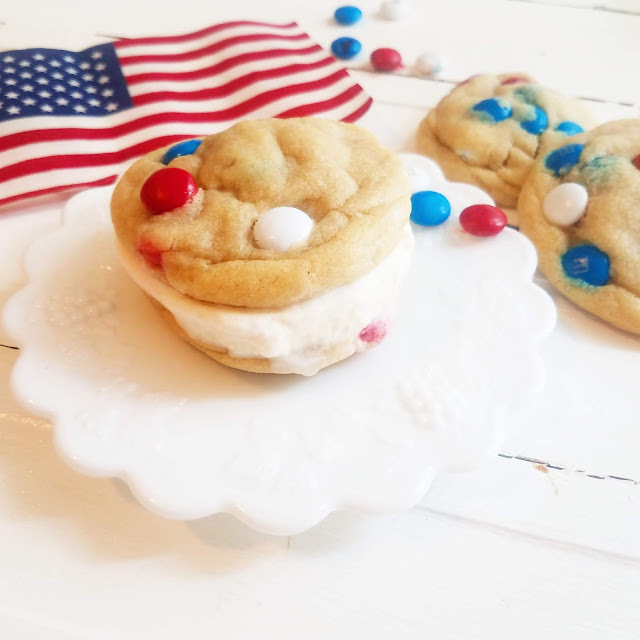 It's just a fantastic, classic, never to disappoint cookie that is perfect for any cookie plate! Jan's Tip: Got holidays coming up? What about substituting fun things like: Chopped Ande's Mints, Crushed Peppermint candies, Caramel Bits Candy Corns, Use your imagination! 2. In a mixing bowl with mixer, cream butter and sugars together until light and fluffy. 3. Add eggs and vanilla and mix until just combined. 4. Mix in the salt and baking soda. 5. With the mixer on low, add all three cups of flour. The mixture will become crumbly, this is ok! It will come together as you continue to mix it. As soon as it starts to come together, mix on med-high for about 45 seconds, then stop. 6. Add in the chocolate chips (or optional ingredients) and mix until evenly distributed. 7. Using a cookie scoop (about 2 tablespoons) form balls and place on cookie sheet. 8. Bake for 8-10 minutes or until the tops are slightly brown. 9. Remove from oven, they will continue to bake on the cookie sheet while they rest on the pan, so they won't "over bake" in the oven! Let the cookies rest/ cook on the pan for 10 minutes before removing to a cooling rack. Don't forget to enter the giveaway! For a full list of the Sponsors Prizes, check out or Welcome Post! For a list of our generous sponsors and their wonderful prize packages that are being offered in the giveaway head over to my : Welcome Post. Disclaimer: Thank you #ChristmasCookiesWeek sponsors: Adams Extract, Sprinkle Pop, YumGoggle and Silpat for providing the prizes free of charge. The #ChristmasCookiesWeek giveaway is open to U.S. residents, age 18 & up. All entries for the winner will be checked and verified. By entering you give the right to use your name and likeness. The number of entries received determines the odds of winning. Four (4) winners will be selected at random from entries recevied. The prize packages will be fulfilled by and sent directly from the giveaway sponsors. #ChristmasCookiesWeek bloggers are not responsible for the fulfillment or delivery of the prize packages. Bloggers hosting this giveaway and their immediate family members in their household are not eligible enter or win the giveaway. No purchase necessary. Void where prohibited by law. This promotion is in no way sponsored, endorsed or administered by, or associated with Facebook, Instagram, Pinterest, Twitter or any other social channel mentioned in the #ChristmasCookiesWeek posts or entry. I'm a fan soft chocolate chip cookies. These look perfect! I love a soft, chewy, chocolate chip cookie too.